I am pleased to announce that Aesthetics + Economics will be covering New York Fashion Week this February! This will be the blog's second fashion week. See you in the tents! The Beauty Addict has just written an interesting piece on the fashion week experience which has inspired me to do the same. In this post I'll dish about the daily routine of a fashion week attendee, the highlights of the week, and the juicy insider tidbits you're looking for, as well as point you to more Fashion Week posts by other bloggers. Part of the fun of Fashion Week was dressing for the occasion. Getting ready in the mornings, I was reminded of the montage in The Devil Wears Prada in which the Vogue girls ready themselves for work. I spent most of my time at the tents in Bryant Park. With my press pass, I'd stride right up the steps, past the throng of onlookers gathered outside, disappointing photographers awaiting the arrival of such figures as Anna Wintour. Walking into the tents was like walking into an oasis of fashion consciousness. The image at the top of this post contains a photo of an extremely chic show-goer taken by the Sartorialist. Imagine walking into a room full of such stylishness, and you've got the idea of the view inside the tents. With the tastemakers who make up the fashion elite, celebrities, members of the press and New York society all under one roof, Bryant Park is a veritable marketing paradise during Fashion Week. 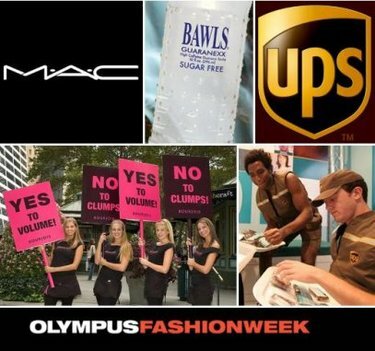 For companies looking to market their products or boost brand image, Fashion Week sponsorship is the golden ticket. For the economics-minded, it's fun to evaluate the PR efforts of the various sponsors. Also, between the handouts from sponsors and the gift bags from the shows, there was a lot of product to sample, and in the interest of promoting efficiency by providing more perfect information, I'll share some of my (and my fellow bloggers') experiences with you. First, I have to hand it to UPS. "Brown" hosted 10 designers in the UPS Hub at Bryant Park and handed out brownies to the fashion press. I now associate the company with fashion and chocolate. At the Lycra Lounge, Beauty Addict, Style Bites and I spoke with J Brand owner Jeff Rudes about the latest breakthrough in the manufacture of skinny jeans: XFit Lycra. XFit Lycra is a four-way stretch technology which promises to remedy the two most common complaints concerning skinny jeans: lack of comfort (or blood circulation, according to some), and loss of shape (more commonly referred to as "stretching out"). Rachel of Style Bites snagged a pair; read her review here. Peroni beer is quite decent (as were the young men handing it out). If you were not at Fashion Week, check out Peroni Italy's La Dolce Vita-themed video podcast--without a doubt the most sophisticated advertisement for beer I've ever seen--for a healthy dose of eye candy. While I'm not so sure about the name of the product, I did like Bawls energy drink, and I think the company's decision to go after the fashion crowd was smart given the group's affinity for caffeinated, calorie-free beverages. (Tom Ford has spoken out about his addiction to Diet Coke, and Atoosa of Seventeen about her daily Red Bull intake.) I wouldn't be surprised if a few fashionistas developed a taste for Bawls Guaranexx--the sugar-free version of the drink handed out for free in the tents--over the course of the week. Personally, I love it; IMO it's far superior in taste to both Red Bull and Tab. To learn more, and to read a particularly apt description of the taste of Bawls (giggles), see Beauty Addict's post on Bawls. Dragana's collection was surprising--in a good way. 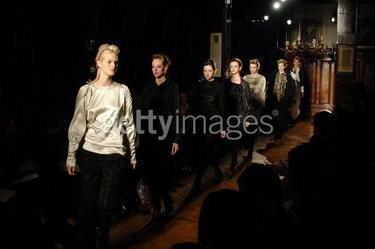 Dragana Ognjenovic of Belgrade brought her work to New York for the second time this fashion week. It was unlike any of the other collections in New York, and thus a break in the monotony of seeing the same trends and colors at every show. 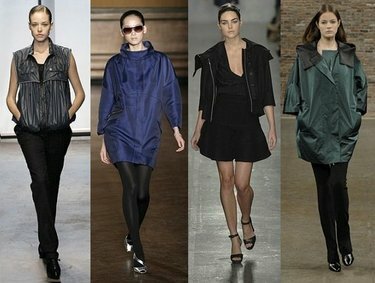 Plus, I went with no expectations and was thus very receptive to what I consider the best looks in her collection. Her work seems a bit rough around the edges, both figuratively and literally. There was a theme of deconstruction à la Margiela throughout; frayed edges and loose threads added interest to several looks (most of which are pictured not above but "after the jump" as they say). However, viewing her collection, one gets the sense that her work isn't as well developed as it could be. While she produced some standout looks, these were interspersed with far too much uninteresting filler. I would also question her choice of fabric for the black jackets and variations thereof (again, pictures of these after the jump). The highlights of the show were a pale pink tiered dress, an ultra-short champagne shirt dress, a couple of coats with high-low hems (well, I'm not exactly sure what you'd call them exactly, but they moved beautifully), and a black tube dress with a pleated piece on the front.